I was excited when I got a free upgrade from Google Docs to Google Drive recently. It comes with 5GB free storage and I love free stuff! 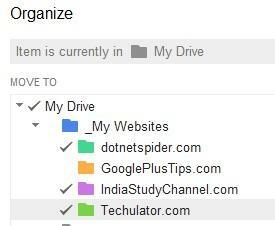 How to organize files under multiple folders in Google Drive? One of my favorite feature in Google Docs was the ability to add files to multiple collections (labels). All you had to do was, select a file, click on "Organize" and click the check boxes to add the file to multiple collections. Isn't it cool to have a file available under multiple folders? Is the option to organize files under multiple collections missing in Google Drive? Ability to organize files under multiple collections is still available in Google Drive, but is not very obvious as it was in Google Docs. The check boxes are no longer available, instead, you have to hold your control key while selecting folders in Google Drive. This morning I was trying to cleanup my Google Docs Google Drive and was trying to organize files under proper folders. I was quite disappointed to see the option to click on check boxes and organize files under multiple folders are missing in Google Drive, which was one of my favorite features in Google Docs. After some trial and error, I figured out how to choose multiple folders for selected files. To organize files under multiple folders in Google Drive, you just need to hold your CTRL key and select folders. 1. Select the file. If you want to choose more than one file, check each of the checkboxes on the leftside of the file. 2. Click on "Organize" button on the top toolbar. (This is the icon that look like a 'Folder'). This will open a popup dialog. 3. In the Organize popup, press the Control Key and select the folders in which you want to move the file to. Even though the checkbox is missing, you can still select any number of folders by pressing the CTRL key. You will see a 'tick mark' for each of the selected folders. It looks less user friendly compared to the same option Google Docs. It was much easier to select the checkboxes than pressing the control key while selecting multiple folders. 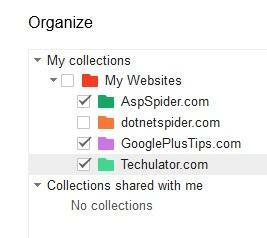 I think Google should go back to the way we were organizing files under multiple collections in Google Docs. Or, atleast, provide a message in the "organize" dialog suggesting how to select multiple folders. I was hoping labels/tags were still supported, this helped, thanks! thanks for posting this! i found that once it went from google docs to google drive it seemed useless and overwhelming. i will have to experiment with this! actually - the real problem is that there doesn't seem to be an option for "don't show in home". everything is listed. it's like an inbox of anything i've ever done! i want to file most things away and only see one folder at a time. Google kept the multiple folders feature for backward compatibility, but they made it obscure because the practice is inadvisable if you intend to use the GD synchronization client that they are now pushing. Steer clear of assigning a file to multiple folders and take care when cleaning up those cases that carry over from google docs. Google drive does not use a hierarchical storage model and performs some serious "gymnastics" to emulate one in the google drive folder on your local hard drive. It's reminiscent of the disparity between gmail labels and mail folders on an email client. The storage model differences cannot be bridged 100% and invariably lead to orphaned files and other disparities between your cloud storage and your google drive folder. To illustrate: assigning a google document to two folders yields two copies of the document on the synchronized local drive, whilst there is only one copy in cloud storage. Contrast that with copying a file from one folder to another. That yields two documents on the local drive AND also two documents with the same name in cloud storage. So...either way, the client appearance is the same, but with a different representation in the cloud and different results when subsequent actions are applied. To make matters worse, GD makes a reasonable effort to mitigate the differences, but is subject to a lag time when replicating changes to the client. So, you also get outcome variations based on timing: specifically, whether or not you use the client file system before or after the synchronizations complete. Use multiple folders at your peril! I'm not quite sure I follow your concern, but I applaud you for attempting to keep your files organized. Understand that google does not really store documents in folders; it just presents them to you that way. The "inbox-like" view that you are referencing is the pool of all google documents and, while occasionally useful, it's probably not the best view for working with your documents on a day-to-day basis. Fortunately, Google drive has many other ways to present a more organized view. I assign all documents to a single folder (never to multiple folders, btw). Then, I can navigate the folder tree on the left side to see a folder at a time on the right side. I think if you experiment a little more, you will find it quite usable and satisfactory. When I used to use google docs, there was a list of docs in the "home" list, and folders on the left. If I wanted a file to only show up within the folder it was asigned, (which was usually the case), I would click "do not show in home". Basically keeping it in "home" is like keeping an email in your inbox (whether or not you've assigned it a folder or not) and taking it out of home was like archiving it - it's there when you look for it in the folder, but it's not sitting there in a big pile. Once I switched to google drive somehow tons of stuff moved into google drive and everything is listed all together in ways that I don't even understand. I don't have an issue with assigning something multiple folders or not - I just want to be able to file it away and not see everything in one big master list all the time. Great tip...brings back the functionality of one of my favorite features. Very helpful! Is this feature still available in Google drive? I want to create my own labels (several), and be able to attach required labels (multiple) to a single document. This helps me a lot especially with the search functionality.